Let me start off by saying, pouting is unbecoming; it's one of my least favorite emotions or sentiments-EVER. But, I'm pouting. As much as I want to stop, I'm having a very difficult time. AND? I'm angry...pretty seriously angry and I know I have to resolve it or it will only get worse. As I write this post, I'm writing from a rented computer. You see the brand new MacBook Pro I bought in February? FRIED! A water bottle with a loose cap was knocked over into the keyboard last week and a few ounces of bottled water spilled right over the track pad and keyboard. Anyway, the OTHER parent was in the room with two children who were throwing a frisbee. Two children who have repeatedly been told not to throw ANYTHING in the house (by me of course). One of them threw it and knocked over the water. Of course since it was MY water, the entire situation was MY fault, right? I immediately (ok, within a few minutes) started trying to drain the water out of the computer. I turned it upside down, blotted the keyboard area with towels, and eventually turned it over on top of a grocery bag filled with rice overnight. The idea being that the rice would pull most of the moisture out. First thing the next day, I called Apple and talked with them about what happened and my options. Since the computer was so new, it was still under the one year warranty, but that didn't cover spills. I was eventually told that even if we'd had Apple's extended care coverage, it would not have covered spills. So anyway, long story short, I was told bottled water, especially only a few ounces, should be easy to recover from. I was given the number of the local Apple store (who were a bunch of jerks, by the way) and a third party Apple repair dealer. I chose the latter, and they have been nothing but helpful. The technician working on my machine has been very patient with me, answering all my questions, explaining technical things I didn't understand, even being honest with me and saying I didn't need an Apple product external hard drive when I recovered from this because a cheaper brand would fit my needs. After all this and a week of working on it, it turns out I am one in a million! Not only is the computer completely out of commission, the Hard Drive is completely unrecoverable! Which I told was a less than 10% chance. SO-tomorrow I go to buy a new Mac AND an external HD because it's tax-free weekend here. And then, on some things, at least, I get to start over. Anything I hadn't backed up recently, is gone-for good. It might not sound like such a big deal to some people, but this is the third computer we've lost in 15 months. First it was the desktop, but I had warning and backed up almost everything. At the time we had a PC laptop so I moved everything, including my home-based business, to that. Then this past February, without warning, the HD on my 4 year old Gateway laptop died. AGAIN, I lost data. Some stuff was backed-up, but only a few weeks earlier, so I lost everything in between. NOW- I hate woe is me kind of stuff, because often we recover and doesn't seem like a big deal. Sometimes, within days, we can look back and wonder what the big deal was. But I've really been doing a lot of "what did I do to deserve this" kind of questioning to myself. This was sort of the straw that broke the camel's back. In June, a family member called me 3 hours before my sons birthday party to see if she could change the menu (which we'd pre-ordered from a restaurant 2 days earlier). She also invited 2 other people to come along and wanted to know if it was ok.
Well, NO; it's not ok! I planned a nice birthday/ Father's Day celebration for my husband, our two Dad's, and my son. And because I had been crazy busy with work related stuff, I straightened up the house, but didn't really clean it the way I would for non-family (or extended family who never visit) to come over. Don't get me wrong! These people would have been welcome to come had I know far enough in advance; I think it's very rude, however, to NOT RSVP for a party whether you plan to attend or not. RSVP, means "respond please" (I don't know French so I can't write the literal acronym). That doesn't mean, only respond if you are coming; it doesn't mean only respond if you aren't coming. It means RESPOND! If the invite says, "regrets only" then you should only call if you can't attend. I'm not sure where our society lost this meaning but no one seems to know it anymore! In July, another incident with someone taking care of my kids and completely undermining my role as their parent. Do you see the theme? I just feel dumped on! Last night though, as I lay in bed, I had an epiphany. I asked God to make me a woman of grace. Didn't I? Didn't I start this blog to figure out how to deal with difficult people and situations with grace? Wouldn't you know, my Bible study this morning? It focused on grace. Here is what I wanted to share with you and felt led to explain in reference to my recent experiences. Grace is favor; benefit. Grace is free; something you receive even when you haven't earned it. Grace is available because of God and HIS ultimate Graciousness. The speaker today said (paraphrased): Whatever your past, God knows what you did; He has grace to cover it! He wants to use you anyway. If He has forgiven your past (and He HAS) then LET. IT. GO! She also said Grace is power (2 Cor 12:7-10); which reminded me of another phrase I've heard, "to err is human, to forgive - divine." Those may not be related to you but here is how they connect for me. I can't earn Grace, but I can give it. 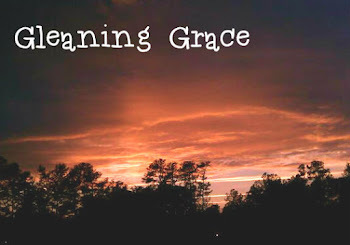 I can't know Grace or be Grace-ful without learning it and without being Grace-less first. I have to extend Grace to these people who have hurt me no matter how hard the circumstances. Forgiving others and extending grace to others who may not have earned it, is powerful for me and them. It releases me from that evil angry hold. AND, if I truly believe He has a plan and a purpose for me (Jer 29:11) and I DO, then I have to Thank Him and praise Him in everything. Not just when things are going well. As parents, we don't just love our children when they behave and then stop when they act up! Even when we discipline them, we love them greatly and the same as before! God does the same with us! His love is unconditional for His children, but do we love Him unconditionally in return? I hate to admit, I don't. Because if I did, I wouldn't be saying "woe is me; why me? What did I do to deserve this" during such a rough patch. Instead, I should be saying, "Thank you, God! You are wonderful and good in all things! I KNOW you have something better in store for me." And again, if you haven't read Ann Voskamp's "One Thousand Gifts"please do. This is the Hard Eucharisteo she talks about. I'm so sorry for your frustration. I, too, am struggling to extend grace. It is what God has called us to, and I feel increasingly lately like God has been telling me to take the higher road. I'm glad God is talking to you through all this and working in your heart.